On the occasion of the exhibition “A syntax of dependency” (03.FEB-22.MAY.11), presented by M HKA as an artistic and discursive dialogue between the two New York-based artists Liam Gillick and Lawrence Weiner, NICC organizes an artist talk with Liam Gillick moderated by Nicolaus Schafhausen. Together with artists such as Damien Hirst and Sarah Lucas, Gillick belongs to the “Young British Artists” who dominated the British art during the 1990s. In 2002, Gillick was nominated for the annual Turner Prize. 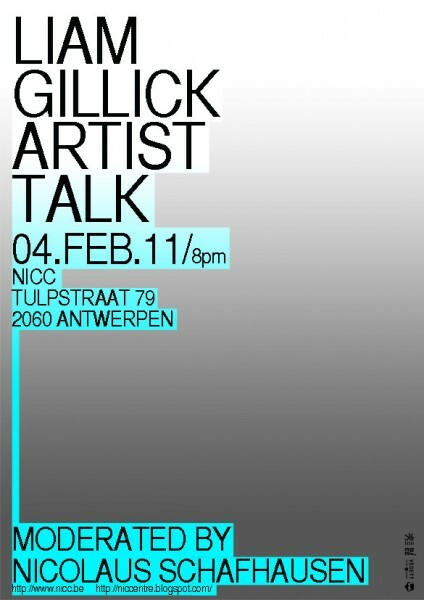 Gillick's artistic output is characterized by the use of text and the diversity of his media (architecture, sculpture, graphic design, film and music). His artworks are often designed as spaces for open social interaction whose actual meaning are to be constantly redefined within the situation of the exhibition. The curator Nicolaus Schafhausen is born in 1965 in Düsseldorf. Since 2006 he is the artistic and financial director of Witte de With, Center for Contemporary art in Rotterdam. He selects Liam Gillick as first non-German artist for the German Pavilion Venice Biennale 2009. Similar to Gillick’s practices, he examines art practice often in relation to contemporary social-political issues.